As part of continued effort to build out its in-house mapping service, Apple recently added 3D Flyover assets to a number of cities and landmarks, including multiple locations in France, Italy and Germany. After flipping the switch on 20 new Flyover-supported areas prior to iOS 9's debut this month, Apple added to the list this week, offering top-down 3D views of major cities and high-traffic destinations. Apple positions 3D Flyover as a tentpole Apple Maps feature, one that sets the service apart from competitors like Google Maps. 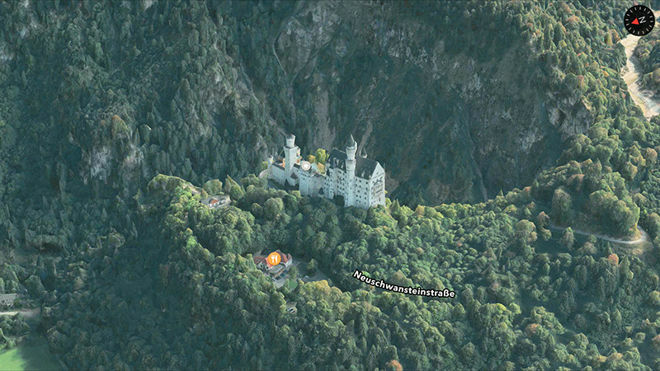 To realize Apple Maps' 3D functionality, Apple overlays high-resolution imagery atop three-dimensional digital models of structures, landmarks and other notable features in a given landscape. Apple Maps also offers guided Flyover city tours for major metropolitan cities and tourist destinations like London, Paris and New York. In bringing its mapping service in line with the competition, Apple introduced native transit directions with its latest iOS 9 update, a much requested feature for many existing users. While availability is limited to a few cities at launch, support for buses, subways, trains and other public transportation services should roll out to a wider audience in the coming months. Looking to the future, Apple is currently gathering street-level imaging and positioning data with mapping vans, suggesting the company is working on a competitor to Google Street View. Apple's equipment-laden vans have most recently been spotted tooling around U.S. and UK neighborhoods. Apple last updated Flyover in August with a buildout of services in Europe, South America and Asia.